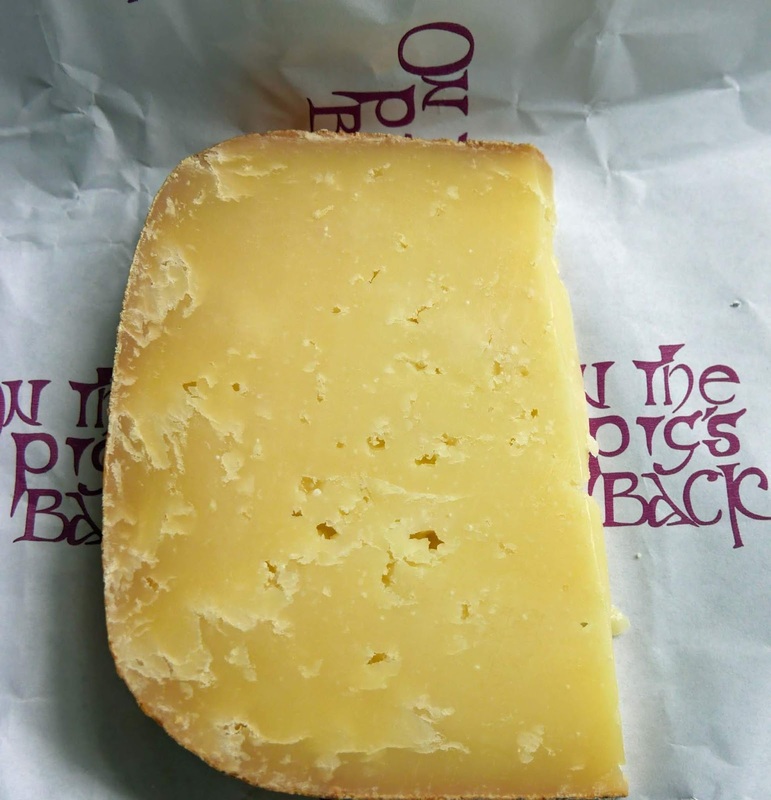 Bought a small wedge of Mature Cratloe Hills Sheep Cheese in On The Pig’s Back on a recent Saturday. Should have bought more of this exquisite cheese, our Taste of the Week. The story of Cratloe Hills cheese began in the mid 80s when Sean and Deirdre Fitzgerald began making it in County Clare on their Cratloe farm that overlooks the Shannon. It is a delicious, full-bodied, intricate blend of tastes with layers of flavours. This is quite an experience as they say themselves: “…each bite brings more hints of butterscotch and burnt caramel come to the fore”. With such a tide of sophisticated flavour from the cheese on its own, you hardly need anything by way of accompaniment. I did try a gorgeous artisan-made Confiture Cerise Noire (from Sheridan’s) as this type of jam is often served with sheeps cheese in the Basque region. And while the combination is pleasant, I’d say the Cratloe is possibly best on its own. By the way, if you think you’d like something with it and can’t get your hands on the Confiture, then Follain’s Loganberry Jam is a good substitute. 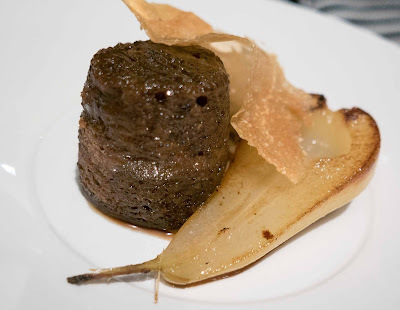 The Clare product is 100% sheep's milk using only a vegetarian starter, rennet and salt. It is a natural product manufactured in a traditional way with no additives or flavours. Seasons come. Seasons go. Café Paradiso notes the comings and the goings in the fields, in the orchards, in the gardens. The orders go out, the fresh produce comes in. Seasons are key. And the customers keep coming to the amazing restaurant on Cork’s Lancaster Quay. Good food calls for good wine and you get that here too on a finely selected list that includes quite a few organic and natural wines. And all are available in four sizes: 150ml glass, carafes of 250ml (quartino) and 500ml (mezzo), and the full bottle of course. We started our early evening visit with a few nibbles: olives, nuts and a delicious seeded flatbread. As we nibbled we picked our wines. My choice was La Stoppa Ageno 2011, a lovely orange wine, made by Elena Pantaleoni in Emilia Romagna (who'll be in Dublin and Cork next week with Le Caveau) while CL’s was the Terras Gauda O Rosal Albarino 2016, one of the best of that now very popular variety. You may need a little help here with the wine and menu if you’re not a regular. We did and it was given freely and informed our choices. 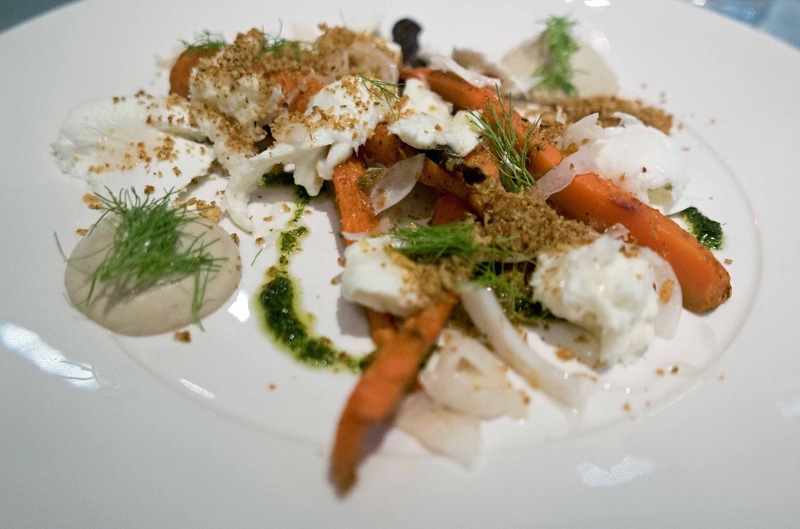 My starter was the Roast carrots, Macroom buffalo mozzarella, burnt aubergine, honey, pickled fennel, ras-el-hanout crumb, a gorgeous plate, full of flavours and textures and not a little colour. 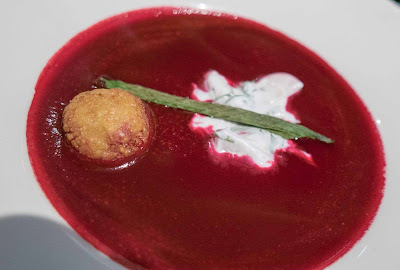 And it was the colour of the other dish that first caught the eye but CL’s beetroot rasam, cauliflower kofta, cucumber coconut raita, a warm soup, had much more going for it as well. 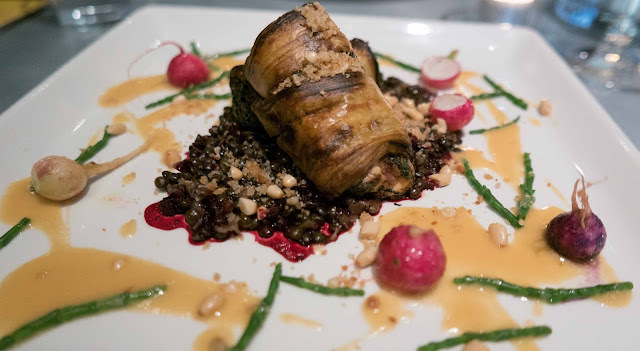 On to the mains then where I enjoyed the Aubergine parcels of spinach and sheep’s cheese with beluga lentils, miso gravy, pine-nut crumb, samphire, and radish. I do like aubergine and it was brilliant as were the lentils, indeed everything on the plate. 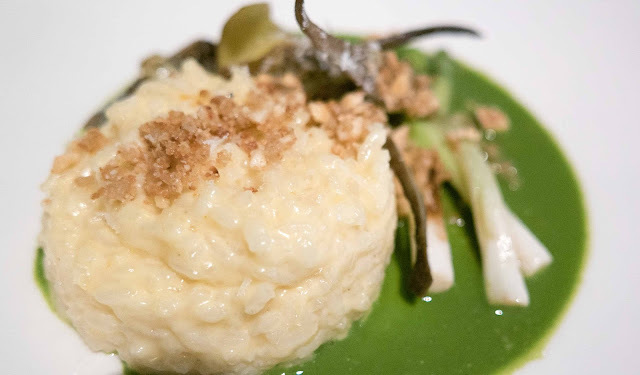 CL meanwhile was delighted with her Confit artichokes, broad beans & scallions with lemon risotto, parsley broth, hazelnut crumb, and Cratloe Hills sheep’s cheese. Again every little piece was polished off and that lemon flavoured risotto was something else. A short dessert list but no lack of temptation though I went a little off piste with Vin Santo with Cantucci Biscotti. And I enjoyed that sweet holy wine (sweet yes, but well balanced) as I begged for a few spoonfuls of the delicious Roast Pear, Pecan Pudding and Beamish Ice-cream that CL had ordered. That Pecan Pudding could be a dessert on its own. All in all, a lovely meal. And indeed a lovely relaxed evening at Café Paradiso where the welcome and the service left nothing to be desired.